When influential elders of the pagan and witchcraft community start to drift from the orthodoxies they helped establish, their published works tend to go a little squirrely. Neo-pagan writers can’t republish the same information repeatedly, while older witches tend to push overtly dated practices as universal beliefs. It often leads to a distinct disconnect to their writings and modern witchcraft/paganism. The more ambitious the title, the greater possibly of the book turning poorly. In addition to aiming to be the definitive book on occult trance-prophecy and possession, LIFTING THE VEIL had a lot to live up to with two Wiccan icons at the helm. True to reputation, at first it looked like Janet Farrar and Gavin Bone would be the rare exceptions that grow better with age. 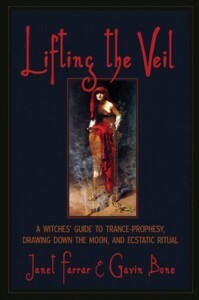 Part I of LIFTING THE VEIL details the history of trance-prophecy/mediumship from ancient times until modern day. Bone and Farrar blend together academic, historical, and spiritual resources to craft a complete image of three distinct types of trance practice: Wiccan/ceremonial Drawing Down the Moon, reconstructive Norse spaework, and Vodoun/Santeria possession. Neither author is compelled to create false equivalencies between the similar practices—a rarity in most mainstream Wiccan-oriented books. The prevalence of fraud is also explored in a serious and thought-provoking manner from a spiritualist perspective, another topic that is often ignored by other published authors. The research isn’t perfect, of course, but that’s only to be expected with non-academic writing. The fact that an effort was made at all is quite admirable. Aside from some questionable tangents regarding pseudoscience and psychology, the first third of the book is a solid read for any occult reader. Unfortunately, the book unravels in Part II. The second section is dedicated to explaining the “four keys” behind the methodology of trancework. Said methodology evolved out of the authors’ own personal experiences and workshops, and it shows. It’s no surprise that LIFTING THE VEIL has a distinctly Wiccan slant, but beyond that it’s difficult to identify the audience Bone and Farrar were aiming for. Between the rampant UPG and baseline assumptions about both Wiccan and non-Wiccan beliefs, the advice and theology strays too far from the norm for a beginner to follow. Advanced Wiccans or ecstatic shamans interested in trancework might like it, assuming they haven’t found another system that already works well for them. Even then, there’s no proper transition between the heavily researched and the heavily personal, further complicated by the authors’ predisposition to speak of spiritual matters in absolutes. Part III discusses rituals, exercises, and processions relating to trancework, and it’s a vast improvement to Part II. Rather than give step-by-step guides, the authors opt to analyze the historical backgrounds and psychological effects of the various techniques presented. There are also transcripts of deity possessions of various individuals included at the end. Advanced Wiccans might like the re-evaluation of some of their oldest traditions and the subsequent advice about injecting trancework into them. Everything is well organized and easy to reference in comparison to the previous two sections. Unfortunately, the subjects covered outside of structured rituals are lackluster, especially since the authors tend to repeat themselves throughout the entire book. Right when the book started to become interesting again, it ended. While LIFTING THE VEIL is one of the better works on trancework currently available, it also leaves much to be desired. If the topic interests you, the book’s worth a read, but it’s hardly a must-buy for an aspiring occultist either.